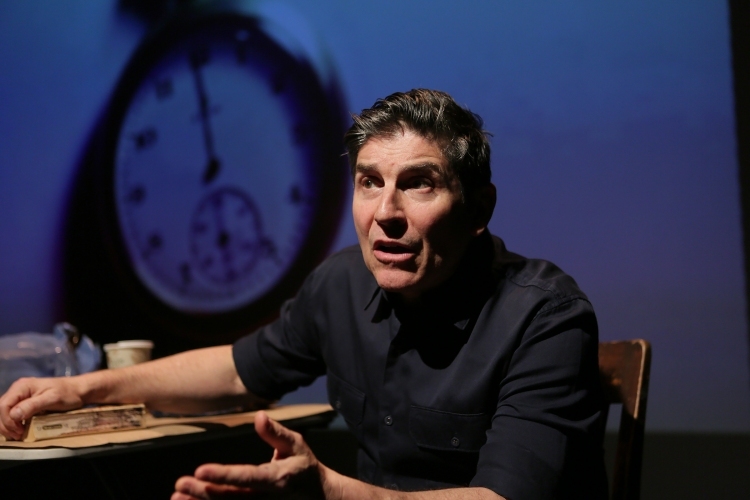 James Lecesne's solo play The Absolute Brightness of Leonard Pelkey, based on his best-selling novel "Absolute Brightness," recently played a critically acclaimed 12-week commercial run Off-Broadway at the Westside Theater. The show is written and performed by Lecesne and directed by Drama Desk nominee Tony Speciale. It features music by Tony winner Duncan Sheik( Spring Awakening). The production also has have scenic design by Jo Winiarski, lighting design by Matt Richards, sound design by Christian Frederickson, projection design by Aaron Rhyne and costumes by Paul Marlow with original animation and photography by Matthew Sandager. In The Absolute Brightness of Leonard Pelkey, Lecesne portrays the various characters of a small Jersey shore town as they struggle to comprehend the mysterious disappearance of a teenager. Through these differing viewpoints, the secrets of the mystery, as well as those of the community, are slowly unveiled. Lecesne is a writer and performer whose short film "Trevor" won an Academy Award. Also the recipient of a Drama Desk Award and nominated for an Emmy, he has created several acclaimed solo shows and collaborated with artists such as Mike Nichols, Elaine May and Linda Lavin. Absolute Brightness is produced by Darren Bagert and Daryl Roth.